If the north part of your home or office is a bathroom, cloakroom, utility or other similar less important room you do not need to do anything and do not read further, if the north is a main door, bedroom, lounge or any other important room you need to take care. For my parents home as an example, the north is where my main door is located and I will not be using it much this month, obviously we cannot control it completely as people like the postman will still be knocking and people will be calling at this part of the home, we will just use it less, AVOIDANCE IS THE BEST CURE. You can place a piece of red cloth here for the month to try and calm things, you can introduce this colour with doormats, rugs, bed covers etc, remember the negative part is just a passing influence so do not start repainting the room red as next month you will not want this colour. The positive aspects of the visiting monthly star may bring obstacles in business or at work as well as illnesses affecting the ears, kidneys and the spleen if you do not have your annual cures in place. Have extra patience when projects or ideas take longer to materialise than you expect owing to the obstacles placed in our way. Children who have a bedroom in this area may suffer ear infections due to colds especially those in cold climates. Be aware that they are more susceptible to this influence and take extra vigilance in dressing them suitably for the climate. This is not a nice combination at all and although easier said than done but you should really try and avoid this area at all costs this month. If this area of your home is a bedroom, front door or office can place a Wu Lou here along with six Chinese coins tied in a row with red ribbon to weaken the monthly #5 sickness and bad luck star. If the east in your home is a bathroom, en-suite, utility room or other unimportant room do not worry and you do not need to place cures, it is only a problem when a bedroom, office lounge or any other important room fall into this area that it becomes a problem. Avoidance is the best cure for this combination of qi. If you cannot avoid using this room, make sure that metal cures are in place like a Wu Lou and/or six Chinese coins tied in a row with red ribbon. Use metal such as gold, copper or brass. You can use whatever metal objects you have got handy in your house, but do avoid objects that are sharp or menacing looking. Do not place any red, pink or orange colours in this area or anything triangular or square in shape and do not burn candles in the east. The qi influence in this palace indicates excellent career opportunities and performance and important promotion. Children should also use this area for studies as it promotes academic achievement and is good for examinations. 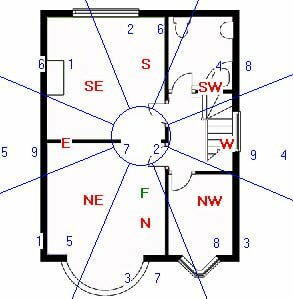 If your child occupies another compass sector of the home try and locate his/her study area in the southwest of the home or southwest of their room and also place a crystal globe in the southeast part where they study, you should also do this if you are in business or want to enhance your career. If your bedroom is located in this sector of the house, do not be surprised if you find yourself feeling a little under the weather this month. The visiting of the monthly star brings with it illnesses affecting the occupants of the bedroom. You can place a small metal (golden) wu-lou by the bedside table to dissipate some of the malevolent influences. Please be very careful with noisy renovations, banging, drilling and hammering in this part of the house this month. It is strongly advised to leave any noisy work/renovations in the south for next month. Those who are recovering from health problems, try to stay away from this area. If you cannot avoid this room, place a decorative item of metal, copper or bronze in the west corner of the room to pacify the monthly #2 influence. If the south is a bedroom and you are not in good health, I would place a wu lou or similar object beside your bed this month, an alternative to a wu lou is something that is heavy and preferably round and made of a good quality metal like brass or copper. A wonderful influence for those who are in the creative field from writers, artists to architects. If your office or study is in this sector of the house or office, the influence of the sector may propel your ideas into reality. This is the month to work hard and pen ideas into proposals and make use of this wonderful influence for future success. Romance is also dominant in this sector and so for those who occupy a bedroom in this corner of the house and are single, enjoy. A red Dragon here is very good but make sure it is not made of metal as it will weaken the good #8 earth annual star. A wonderful sector for couples as this is a good sector for building relationships. Marriage may also be a possibility when under this romantic influence of the month. This is also a good sector for those who are preparing for exams. If your bedroom is in this corner of the house, place something blue, e.g. throw over, rug etc, in the south corner of the bedroom. You can also place, if you have them a pair of Mandarin Ducks to enhance romance. There is fame and acknowledgement, growth and improvement. It affects the eyes, mental disturbance, blood disorders and stomach and can cause problems at work. These problems only occur when you have poison arrows directed to this area this month. It also affects wealth career and luck and because it is timely in period 8 (2004 – 2024) it is considered an auspicious flying star. If you disturb this area this month you may cause problems for the middle daughter and it could affect heart, stomach or blood related. If you have any poison arrows like lamp post, pylons or large comers of house pointing toward this area consider hanging a flat ba gua mirror outside pointing toward the offending object. Generally though there is nothing to worry about with the #9 star as it is it is timely and an auspicious star. Those whose bedroom or office door is located in this area and who are engaged in negotiating new ventures and businesses will feel that the element is with them. Those involved in politics will also see success. If you have activated the primary wealth corner of your property with an outdoor water feature, you may see gains in financial and career aspects. The benevolent qi of this palace is very strong in this area so make good use of this area as much as you can. If you have a main door in this sector, leave the door open as often as security or climate allows bringing in this benevolent qi to benefit the rest of the house. If there are any aspects of your life that you wish to improve this month place a symbolic object in the northwest, an example would be if you were applying for a new job, place the application copy forms in the northwest or northwest of your room. If this is your bedroom though you still need to be careful and ensure your annual cures are put in place although it is not as bad as previous months. Make hay while the sun shines. Offices with doors located in the southeast or an office in the northwest may find their business go up a beat this month. The energies denote potential business opportunities. If you happen to occupy an office in the northwest, stride ahead with your plans and ventures. If you have a crystal globe this is a great place to have this month. Keep this part of the home active and if you have children encourage them to play here providing it is safe, this only applies to this month though. For those who like to work with symbolic objects, you can place your three legged toad in the northwest corner of the office /study but make sure that it faces into the room and not outwards and the coin is always kept in his mouth. Make sure you remove them next month. Accidents usually happen when we are in a hurry or not paying due attention to what we are doing. Be very attentive in not leaving lit candles unattended in this area of the house. Keep matches and lighters out of reach of curious little hands. The month’s influence may spark their curiosity out of the blue. I \’ve been to a Feng Shui master and bought some cures. My house is very sensitive and when i\’m replacing or move something it will have almost em effect. Is that normal? Like for ex when i place something red in Nord-east, also my totall loss, i\’m having problems like in 5 minutes. I never knew about Feng Shui, became very ill, lost all my teeth, almost died and then my grandfather came around. He \’s not here anymore but he gave me signs and that\’s how i got to Feng Shui. He made a drawing Picture for me with horses when i was a child. This picture a gave to my sister later. i didn\’t know what he meant. Later my sister ans I were talking about this and she came about the drawing. Years later when my sister was moving to another house, now like 4 mt ago, the picture was found by cleaning the house. My best corner is Soud…place horses there they say,,,isn\’t it special! I must say at first when i started FS i was getting better by the day. But after a wile when i starterd reading more and more i became very much afraid. I looked back at pictures from my house during times of sadness and disaster and then i really became even more afraid.. I Always found such a joy in decorating my room and changing but now i\’n afraid of it, it\’s really disturbing my happiness in life. I\’m looking for someone who can give me advice for example how to use colors in the house. For example can i make my lamp\’s in the center green? And is it bad to have a mirrir in the center. And does the stuff you put in you closeths also have effect like i\’n having my creatice cards and color\’s put in the center now …. Some people have very quick reactions to changes in their home and this is completely normal. I know it is easy to say but do not feel afraid of making changes around the home; every year and month we write articles for the visitin Flying Stars and this is really easy to follow, here are the links Jessica http://www.fengshuiweb.co.uk/advice/flyingstars2016.htm http://www.fengshuiweb.co.uk/advice/teachyourselffengshui.htm . These articles give advice on Cures, colours, decorations and more and make it really simple to apply the relevant changes. I hope this helps Jessica and also puts your mind at rest. Sorry for the late reply. Could you please confirm if you were born in January or April as this can change the results. It would be fine to put the water feature in the southeast this month. Hello could you please send me a complimentary cheque too please? Can you please send me your date of birth. You should place this where the Annual or Fixed #8 Star is located in your home.